The electricity went out here the other day. Me, I've only got the garage door opener & every door is locked. One window was open, but we have screens that don't allow easy popping out. They have little levers that need to be flipped up. The levers are on the inside. So, MomGyver sifts though her purse & comes up with a knitting needle. 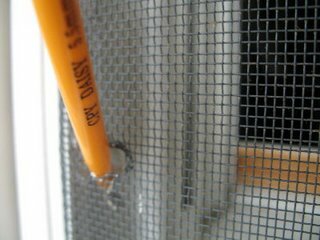 I still had to tear the screen, but the needle made a much smaller hole than my finger & was still & tough enough to flip the screen latch. 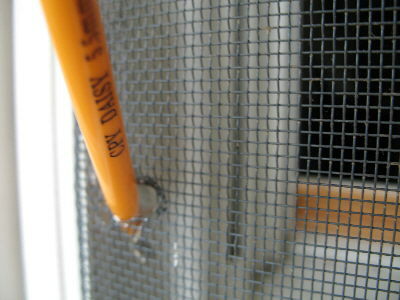 Plus all the contact with the metal screen made not a scratch on these needles. 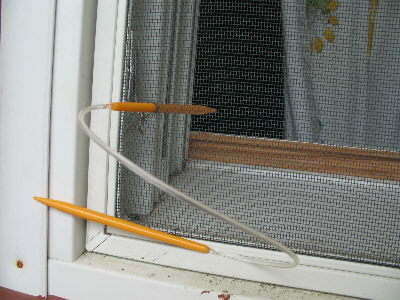 I wonder if the FBI has a circular knitting needle in their files of B&E tools for reference? LOL Now THAT's ingenuity! this should be a lesson to us all, WIP's don't leave home without em! That one made me snort. This hasn't do to with your post. I can't get your email to ask you this question. First of all, hi, how are you doing? I was on Knitty.com where I found your Bob and Weave shawl pattern which I fell absoluately in love with it. I am thinking that this is a perfect Christmas present for my girlfriend who lives in Australia. But when I went to check out the yarn, Artfibers Gypsy and Artfibers Houndini, I got an error page. Could you please, please, please tell me more on the yarn, like is it lightweight, sports yarn. Thank you so much. Oh you can email me back at indianna@shaw.ca . Thanks again.